Aired on Tuesday, October 9th. On this edition of ST, we chat with our friend and colleague, John Wooley, who's been hosting his popular "Swing on This" western swing program on Public Radio Tulsa KWGS 89.5-1 for the past nine years or so. This show is heard every Saturday night at 7pm, and this coming Saturday, the 13th, John host a special, two-hour broadcast of his program, LIVE from the historic Cain's Ballroom in downtown Tulsa. The big show runs from 7pm to 9pm, and you can find more info on this event (including the 4-1-1 on purchasing tickets) here. 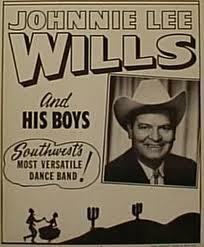 As John tells us today, one of the goals for this event is to celebrate the centennial of Johnnie Lee Wills (1912-84), the western swing superstar (who might not have been as famous as his brother Bob, but who was clearly a music legend in his own right). The upcoming show at the Cain's promises to be a night of great live music, lots of dancing, and plenty of fun, and all the proceeds from this event will benefit Public Radio Tulsa. Also on our show today, Dr. John Henning Schumann, one of our regular commentators, presents a state-of-the-art (but not quite 100% enthusiastic) reflection entitled "Docs and Computers." 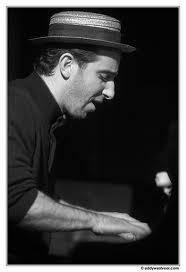 Our guest on this installment of ST is the widely celebrated NYC-based jazz pianist Aaron Goldberg (born in Boston in 1974), whose playing has been tagged by The New York Times as "versatile and impressive, and he swings hard.... [He's a] sharp young pianist with a superb rhythm section." He has been active on the national/international jazz scene since the early 1990s, playing with everyone from Betty Carter, Wynton Marsalis, Al Foster, and Terry Gibbs, to Joshua Redman, Mark Turner, Ali Jackson, and Kurt Rosenwinkel.